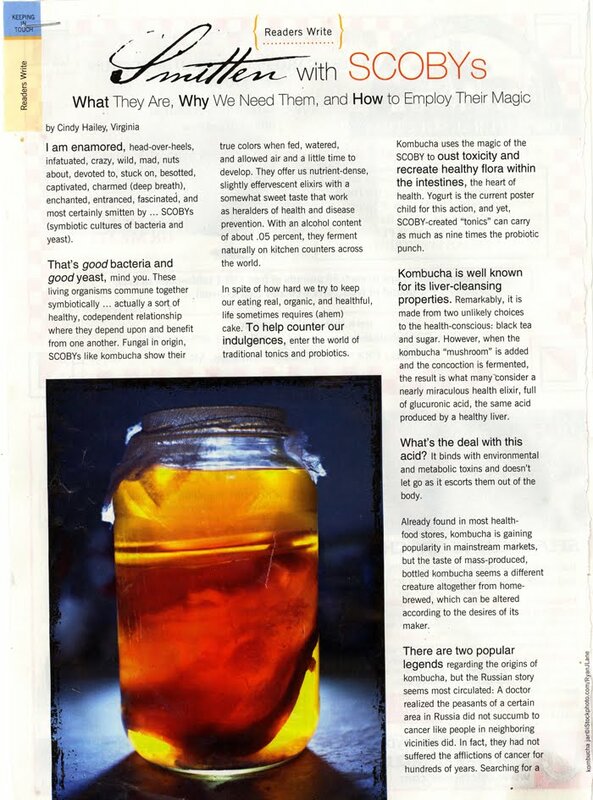 It seems as if Kombucha is all the rage lately with it's health claims of eliminating toxins, improving energy levels, preventing cancer, to - you name it. Well I don't know about it being a cure-all but I do know the store bought Kombucha is too expensive for me to drink on a daily basis. So I set about to figure out how to make my own. 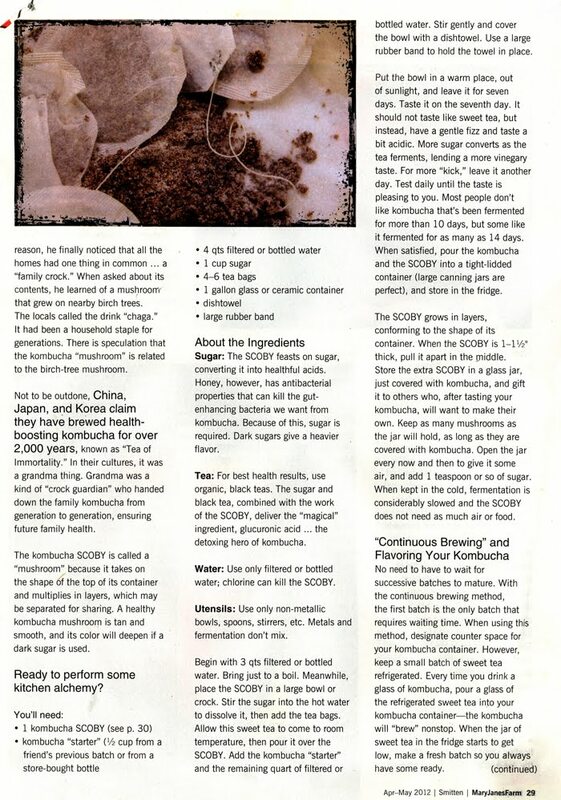 There's nothing new about Kombucha, that's for sure. I remember my friend Carol making it in her kitchen around 20 years ago when it's popularity soared back then. I was inspired to try my hand at making it at home when I saw an article in Mary Jane's Farm magazine. I've included that recipe and info at the bottom of this post. 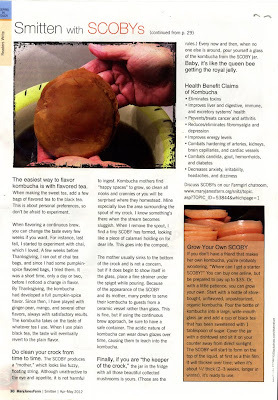 Another good place for How-To Make Kombucha is Bonzai Aphrodite's site. I like the way she stresses keeping everything clean and using common sense. Basically that's your starter, think of it as a sourdough starter and you get the idea. You can purchase these but I didn't feel like paying $35 for something I could make at home for around $3 and a bit of patience. As the recipe says, I started with a bottle of store-bought Kombucha, unflavored, unpasteurized, and organic. Pour it into a large, wide mouth glass jar and add a cup of black tea (I used organic tea made with filtered water) that has been sweetened with 1 tablespoon of sugar. (You can use either white or brown sugar but NOT honey or Agave syrup.) Cover the jar with a dishtowel and set it away from the sun. (I put it in our pantry.) 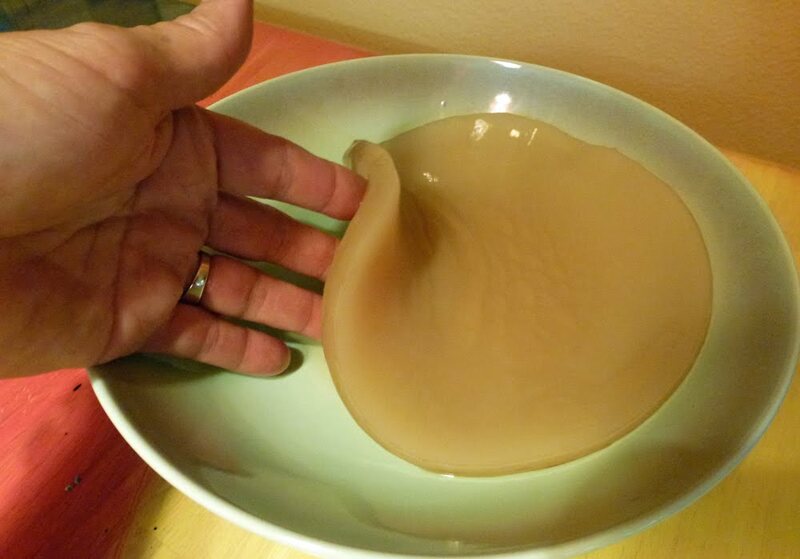 The SCOBY forms on the top. When it's about 1/4 inch thick (around 2-3 weeks later), it's ready to use to make your Kombucha. 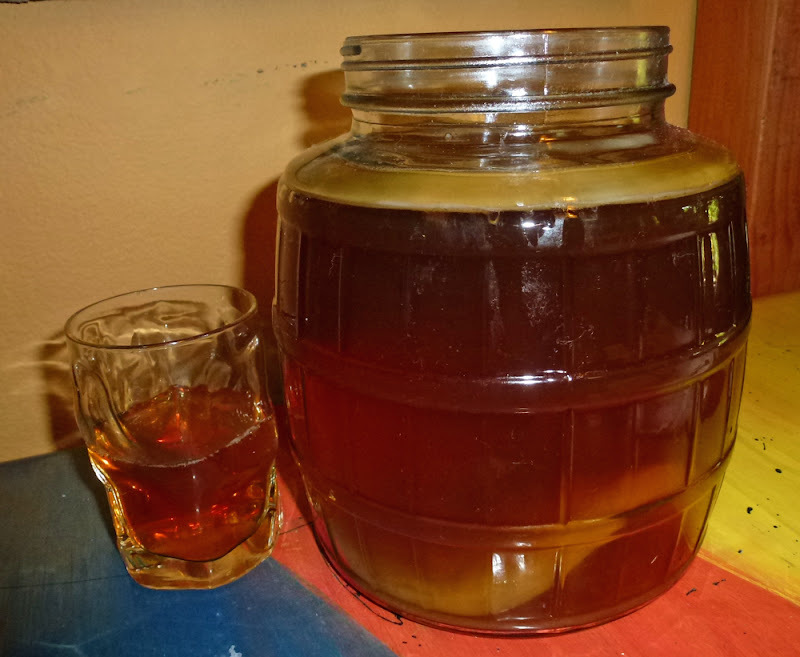 Now you're ready to get the real Kombucha brewing. 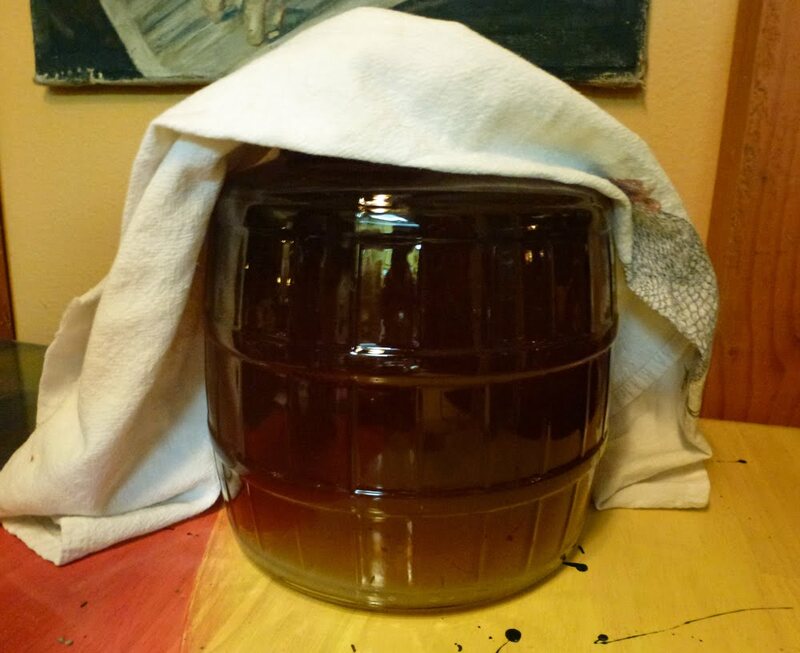 Start with 3 quarts of filtered water (chlorine can kill the SCOBY) and bring it to a boil. 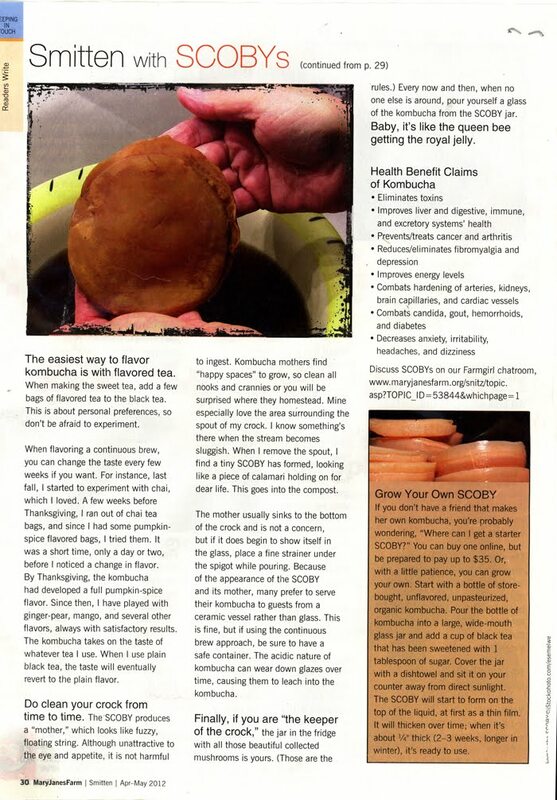 Place the SCOBY in a gallon crock or glass jar. Stir 1 cup of white or brown sugar into the hot water to dissolve it, then add 4-6 tea bags (caffeinated, organic). Let this come to room temperature then pour it over the SCOBY in the jug. Add 1/2 cup of store bought Kombucha and another quart of filtered water. Cover with a dishtowel, using a rubber band to keep it tight. Put the jug in a warm place, out of sunlight and leave it for seven days. Taste it on the seventh day. It should not taste like sweet tea but have a gentle fizz and taste a bit acidic, like vinegar. You'll get a less sweet taste the longer you allow it to ferment so continue to taste daily until you get it where you want it. Then you can store it in the fridge or use the continuous brewing method to keep it going. The recommendation is to use a jug with a spout on the bottom so you can easily pour your Kombucha into your glass for drinking. The jug I purchased leaked from the spout so for now I'm using a ladle to scoop out my Kombucha for drinking. Then I replace the amount I took out with sweetened tea from the fridge. (I'm still using filtered water to make the tea, and be sure to use plastic or glass, not metal, utensils in your Kombucha). I can buy a gallon of filtered water from the co-op with my own jug for .39 cents. I've been drinking my Kombucha every morning. 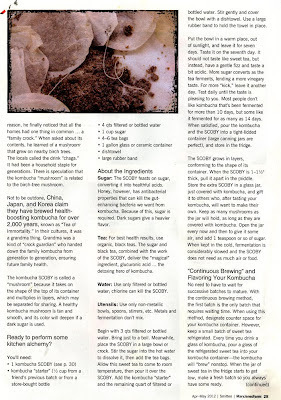 I like the way this recipe talks about changing the flavor of your Kombucha slowly by using different flavors of tea. Also as your new SCOBY forms you can share these with friends so they can start their own batch of Kombucha. 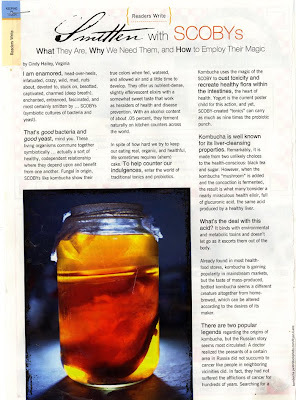 Just keep the new SCOBY in a jar or bowl in the fridge and cover it with Kombucha so it doesn't dry out. It won't "work" much in the cold fridge and so will keep for some time. I've used some chai flavored tea so for now my Kombucha tastes a bit like apple juice. I'm certainly enjoying it. I pull out a glassful and add a couple ice cubes to chill it before I drink it. 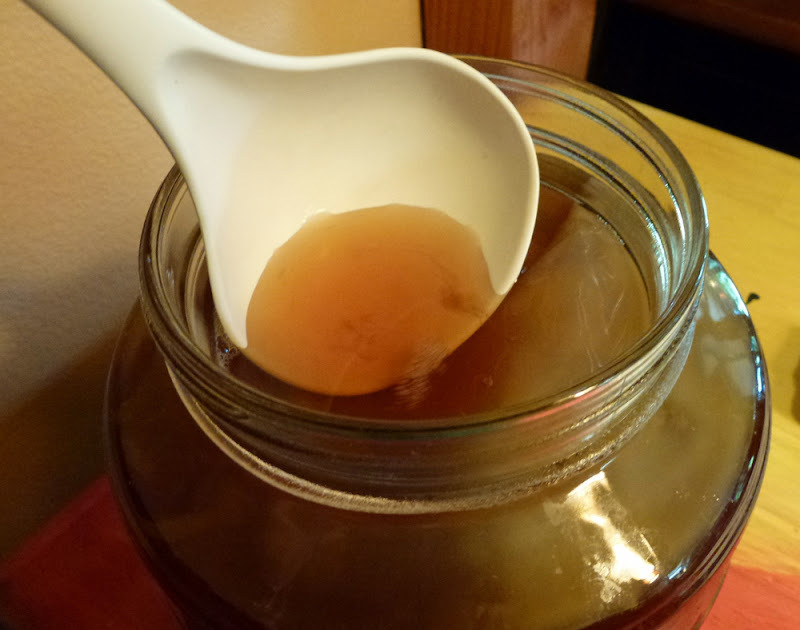 There are many places on line to read about making your own Kombucha. Just find one that makes sense and follow the directions. Then enjoy. Let me know if it cures anything! Je ne connaissais pas, je découvre, je suis même allé voir dans Internet... merci pour l'info ! Never heard of this drink... Looks interesting but would I make it probably not .....impresses me that you did! Mais qu'est-ce que le Kombucha??? Mais qu'est ce que c'est au départ? jamais entendu ce nom! I love kombucha, and make it too. 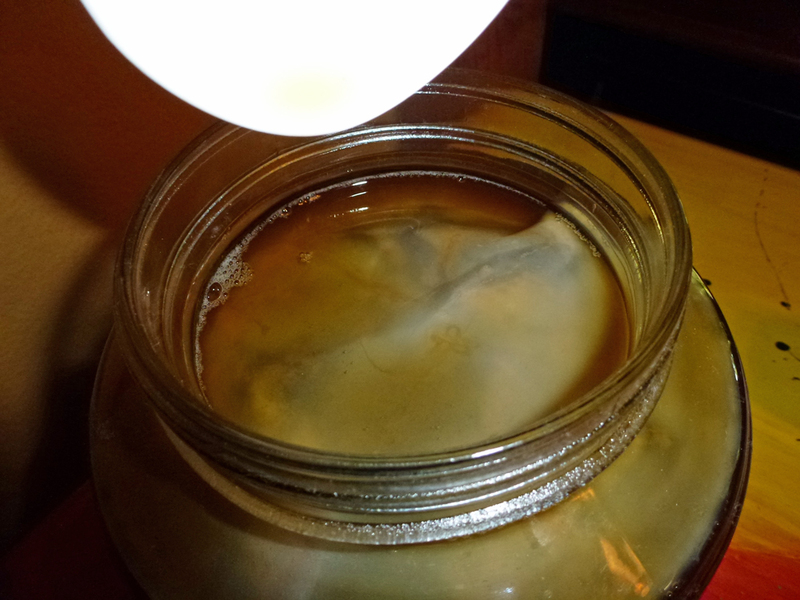 I made my own scoby like you did - such a fun experiment! I do kefir too, with authentic grains and raw milk we get from our herdshare with a small, local pasturing farmer. I haven't noticed a big health improvement with kombucha, but kefir has been a wonderful thing for my digestion which got pretty beat up a few years ago after food poisoning and antibiotics. I make my own sauerkraut too. It's cool to work with those old-fashioned, artisanal fermented foods crafts - fun, easy, rewarding, and healthful, and it's like a science experiment every day.